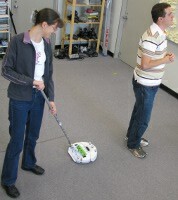 The style in which a robot moves, expressed through its gait or locomotion, can convey effective messages to people. For example, a robot could move aggressively in reaction to a person’s actions, or alternatively react using a set of careful, submissive movements. Designing, implementing and programming robotic interfaces that react to users’ actions with properly styled movements can be a difficult, daunting, and time consuming technical task. On the other hand, most people can easily perform such stylistic tasks and movements, for example, through acting them out. Following this observation, we propose to enable people to use their existing teaching skills to directly demonstrate to robots, via in-situ acting, a desired style of interaction. In this paper we present an initial style-by-demonstration (SBD) proof-of-concept of our approach, allowing people to teach a robot specific, interactive locomotion styles by providing a demonstration. We present a broomstick-robot interface for directly demonstrating locomotion style to a collocated robot, and a design critique evaluation by expe-rienced programmers that compares our SBD approach to traditional programming methods. Download the Style by Demonstration: Teaching Interactive Movement Style to Robots video file.